Finally there’s a protein shake that gets it right. No garbage ingredients, bad taste, or clumping. Just a high-quality, delicious way to get your nutrition. It feels like a gamble every time you try a new protein powder. You never know what you’re going to get. Will it taste good? Is it going to be clumpy even after ten minutes of shaking? What the hell are these ingredients? 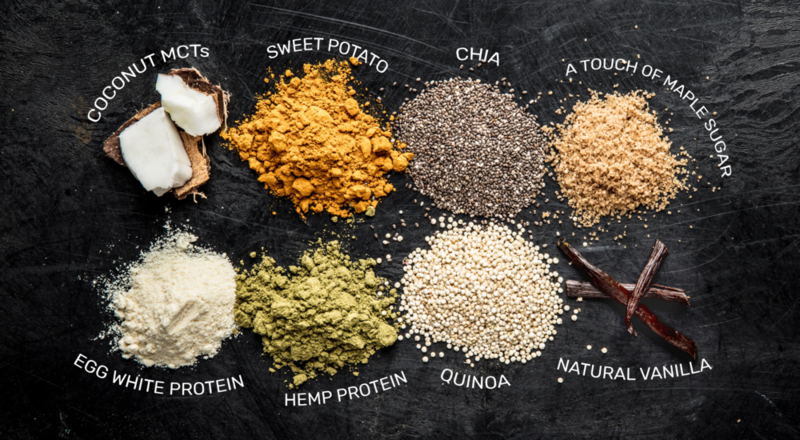 Finally, there’s an all natural protein powder that gets it right. But it’s more than just a protein shake -it's a complete and delicious drinkable meal. Most protein powders deliver just one thing - protein, when in reality, you need balanced nutrition to build quality muscle. Enter Warrior Meal- a new kind of shake inspired by muscle building Military meals ready-to-eat (MREs) that act as a full meal replacement, delivering key ingredients in each drink including good fats from coconut MCT oil, low GI carbs from quinoa and sweet potato, and high- quality protein from eggs and hemp. Warrior Meal is made with all natural, real food ingredients and is 100% dairy and gluten free. Plus, $1 from each bag sold goes to benefit veterans struggling with PTSD. Simple and easy to mix, Warrior Meal is the perfect pre and/or post-workout meal replacement powder, or for whenever you don’t have time to get a healthy meal in. Warrior Meal is real food, fast. I’m not saying I’m a protein powder snob but I’m pretty particular about a few things when it comes to my protein. I want it to taste just halfway decent and it needs to mix well - meaning no clumping. Warrior Meal passes both of these tests with flying colors. It says on the bag to mix the powder with water but I used almond milk and it worked out great. I later tried it with water and the taste wasn’t as good. I recommend almond milk, oat milk, or whichever milk you prefer. Warrior Meal is made with only high-quality ingredients and they’re the ones you want to refuel with after a tough workout. Coconut MCT Oil - Contains 55% MCTs and all 4 medium-chain fatty acids. Research has shown that MCT oils may play a role in successful weight management, and can improve energy and endurance. Sweet Potato - A rich source of fiber, vitamins, and minerals. Chia - An excellent source of omega-3 fatty acids, antioxidants, fiber, iron, and calcium. Maple Sugar - High in sugar, but Warrior Meal uses a small amount. The benefits of using maple sugar include the vitamins and minerals it contains, and it’s a significantly better choice than refined sugar. Egg White Protein - High in protein yet low in calories, fat, and cholesterol. Hemp Protein - High in fiber, healthy fats, and many vital nutrients. Hemp protein also contains high amounts of the amino acid arginine, which is used for the production of nitric oxide - a vasodilator that relaxes the inner muscles of your blood vessels, causing the vessels to widen and lowers blood pressure. Quinoa - A good source of amino acids, calcium, magnesium and manganese. Natural Vanilla - High in antioxidants. A serving of Warrior Meal (two scoops) comes in at 200 calories, with 19 grams of protein, 4 grams of fiber, 16 grams of carbohydrates, and only 2 grams of sugar. I first gave Warrior Meal a try after my morning workout and am pleased to report that it was great. The vanilla bean flavor tasted sweet and the powder mixed well. A one-pound, ten-meal bag is only $29. And for all you travelers, Warrior Meal is launching single serving packets in the coming months. Grab Warrior Meal on Amazon. All photos by Warrior Meal. May 20 Quest Bar vs. RXBAR: Which protein bar is better?